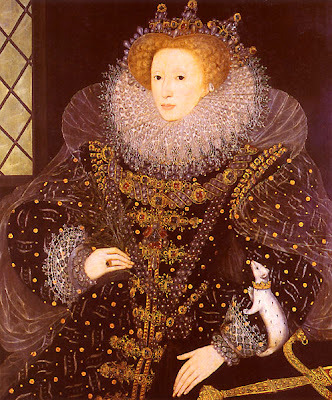 Queen Elizabeth (1533-1603) was the source of inspiration and the subject of innumerable works or art, poems and dedications during and beyond what is considered as the richest era of English literature. As queen she was also the historic proof of her father's misconception : the primordial importance of a son and heir to the throne of England. However, as this served also as the necessary reason for the king to divorce from Roman Catholicism, Henry VIII unwittingly accelerated the process that would end monarchial absolutism, and gradually create the freedom which led to the establishment of parliament and modern democracy sooner in England than anywhere else in the world. Queen Elizabeth was a skilful political ruler and a highly educated woman. Considerably versed in Latin and Greek, she was tutored mainly by Roger Ascham, but other humanist scholars also assisted in her education. She, unlike some of our present day heads of State, wrote her own speeches. She made several poetic translations from Petrarch, Seneca, Horace; prose translations from Boethius, Plutarch, and Queen Margaret of Navarre, the French Protestant. She also wrote her own poems that mostly dealt with the events of her personal and public life. The three examples below illustrate this very well. Her speech to the troops is especially moving. This address alone raises her as an English monarch, to immortal heights. Which would not be, if reason ruled or wisdom weaved the web. Shall be unsealed by worthy wights whose foresight falsehood finds. Shall reap no gain where former rule hath taught still² peace to grow. Our realm it brooks no stranger's force, let them elsewhere resort. To poll¹ their tops that seek such change and gape for joy. ° Concerns Mary Stuart, queen of Scotland, Elizabeth's Roman Catholic cousin, the subject of many conspiracies against the queen. ² The tide of faith that ebbs giving way to the rising tide of falshood. ³ Undetected tricks that will turn to rain of repentance. ° Deceptions that will come to nothing (fruitless). ¹ 'Also.' Mary was also known as the 'Mother of Debate' because she inspired conspiracy. ² Stable. Former rule being stable. Since from myself another self I turned. Till by the end of things it be suppressed. Or be more cruel, love, and so be kind. Let me or float or sink, be high or low. Or die and forget what love ere meant. ° The end of marriage negotiations between Elizabeth and the French duke of Anjou (1582). ³ My sorrow and regret (rue) that he caused. We have been persuaded by some that are careful of our¹ safety, to take heed how we commit our selves to armed multitudes, for fear of treachery; but I assure you I do not desire to live to distrust my faithful and loving people. Let tyrants fear, I have always so behaved myself that, under God, I have placed my chiefest strength and safeguard in the loyal hearts and good-will of my subjects; and therefore I am come amongst you, as you see, at this time, not for my recreation and disport, but being resolved, in the midst and heat of the battle, to live or die amongst you all; to lay down for my God, and for my kingdom, and my people, my honour and my blood, even in the dust. I know I have the body but of a weak and feeble woman; but I have the heart and stomach of a king, and of a king of England too,² and think foul scorn that Parma³ or Spain, or any prince of Europe, should dare to invade the borders of my realm; to which rather than any dishonour shall grow by me, I myself will take up arms, I myself will be your general, judge, and rewarder of every one of your virtues in the field, I know already, for your forwardness you have deserved rewards and crowns;° and We do assure you in the word of a prince, they shall be duly paid you. In the mean time, my lieutenant general¹ shall be in my stead, than whom never prince commanded a more noble or worthy subject; not doubting but by your obedience to my general, by your concord in the camp, and your valour in the field, we shall shortly have a famous victory over those enemies of my God, of my kingdom, and of my people. ° Address to the land forces at Tilbury, Essex, who were to counter the invasion of the Spanish Armada sent by Philip II. The Armada never reached England due to storms. 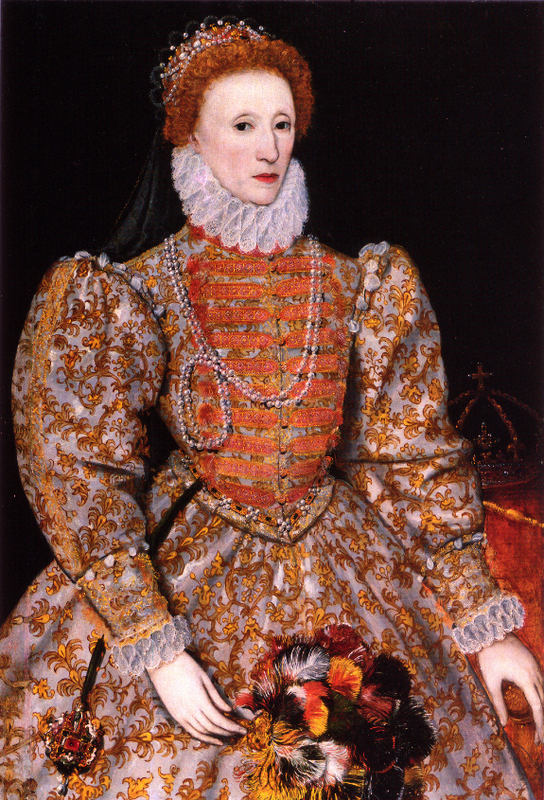 This was generally regarded as a God sent miracle, a divine favour to Elizabeth and to England. ² The two bodies, one being mortal, the other the ideal monarchial concept. ³ The Duke of Parma (Alexander Famese) who made an alliance with the king of Spain and was also expected to invade England with the Spaniards. ¹ The Earl of Leicester, Robert Dudley, leader of the queen's forces. He was a favourite courtier of the queen, and there were rumours at one time that he was her lover and a possible choice of future husband. A rare survivor interested in sharing illustrated points of views and personal works on all subjects of interest, with the aim of contributing to further international communication, tolerance and understanding. All articles and images on Viewfinder are © protected when this directly applies. Please note that in such cases nothing may be used without first obtaining written authorisation. Any unauthorised use of such text or images will be treated as illegal infringement. Thank you for your co-operation in this regard.